In Somalia, Another Government Teetering? militant Islam and the secular West. That was before the return to Somalia of Sharif’s erstwhile Islamist comrade, Sheik Hassan Dahir Aweys. new group calling itself Hizbul Islam, hard-line Islamist rebels known as al-Shabaab have made steady gains across the country against forces loyal to Sharif. 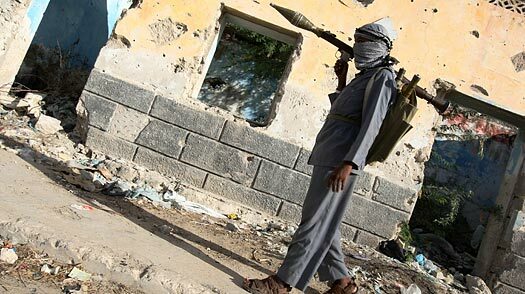 After some fierce street fighting in Mogadishu last week that killed more than 100, al-Shabaab on Sunday took the town of Jowhar, just north of the capital, and on Monday the nearby town of Mahaday. Sources inside Mogadishu report that Sharif now controls little more than a small patch of territory near the center of the city, although, crucially, his forces also still hold the port. Analysts and observers differ on the extent of peril facing the new government. Mogadishu has not known peace since the demise of the last national government in 1991  and a period of relative calm during the six months when the ICU controlled the city  and it is plagued by a byzantine maze of miniwars between clan militias that often control as little as a single building. In that context, an eruption of more fighting is often merely a sign that the bloody stalemate continues as usual. A diplomat in Nairobi suggested that while Sharif’s forces were short of ammunition, the President was confident he had sufficient forces to survive al-Shabaab’s attacks. But others believed there was a real possibility Sharif might be defeated. “He’s taking a real beating,” said an observer. “We’re wondering whether he’s going to be pushed into the sea.” The BBC reported Tuesday that eyewitnesses in Somalia claimed that Ethiopian troops had re-entered Somalia, just months after their departure, but these claims were vigorously denied by the Ethiopian government. The fate of Sharif’s government is closely tied to efforts to suppress piracy in and around the Gulf of Aden, but Somalia has also long served as a battlefield for regional rivalries. Last week the U.S. accused Eritrea of being behind the latest upsurge in violence in Somalia  the U.N. has previously accused Eritrea of supplying vast amounts of weapons to hard-line Somali Islamists as part of a proxy war against its nemesis Ethiopia, whose intervention in Somalia was backed by the U.S. The Somali Islamists in 2006 declared a jihad against Ethiopia, while the U.S. says al-Shabaab has links to al-Qaeda and is sheltering the surviving member of a cell that bombed U.S. embassies in East Africa in 1998. Osama bin Laden, for his part, has repeatedly backed al-Shabaab, which the U.N. says is reinforced by some 280 to 300 foreign jihadist fighters. Those fighters are attracted both by the chance to live under the strict Shari’a law imposed by the Shabaab and by the opportunity to fight the Americans, who have bombed Islamist forces on several occasions since 2006 and are believed to have undertaken several covert missions on the ground. The fighting has hampered the relief effort to ease the effects of a punishing drought, meaning that whatever its outcome, the losers will likely be the estimated 3.2 million Somalis dependent on food aid.